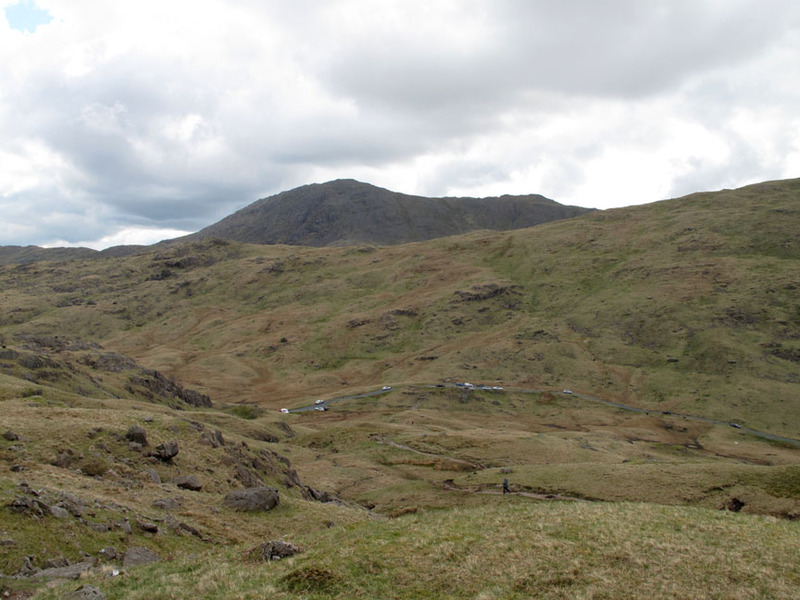 Pike o'Blisco and Cold Fell. Date & start time: Saturday 1st May 2010, 11.45 am start. 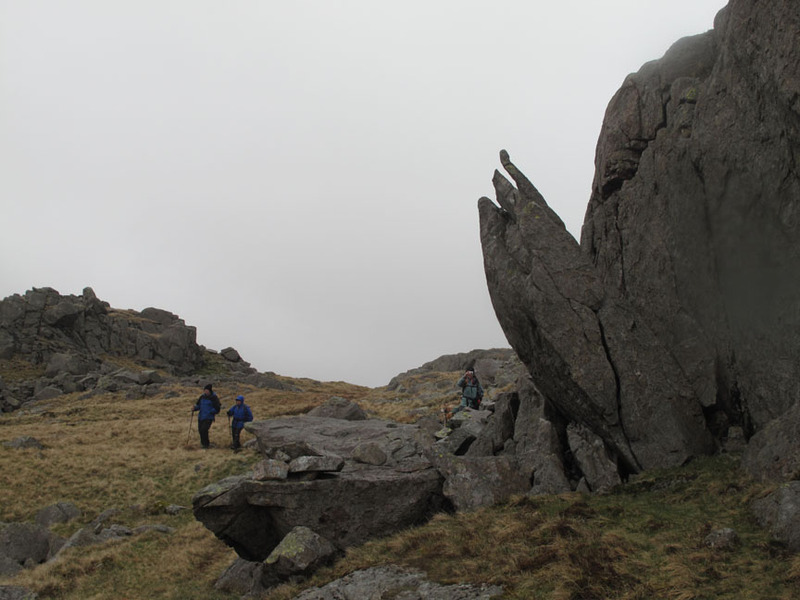 Places visited : Black Crag, Pike o'Blisco, Red Tarn, Cold Fell, back to 3 Shires Stone. 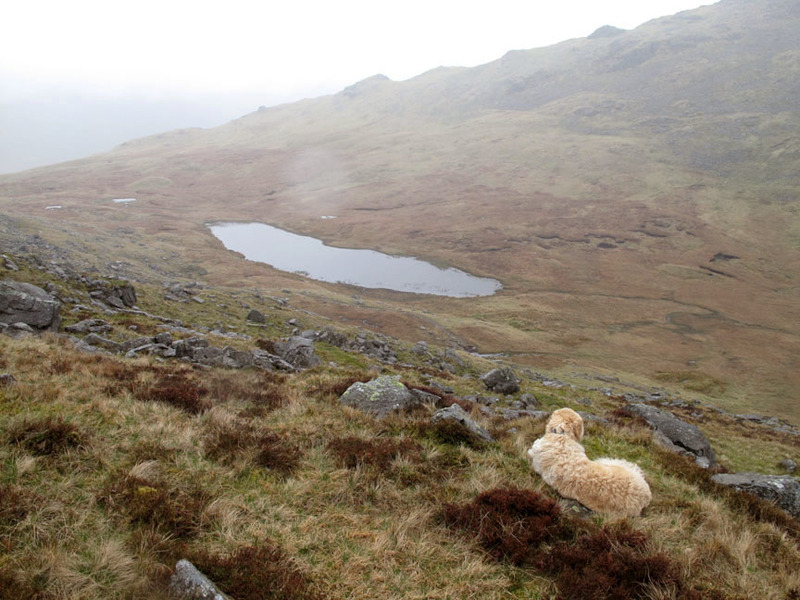 Walk details : 4.1 mls, 1600 ft, 4 hrs including lunch. 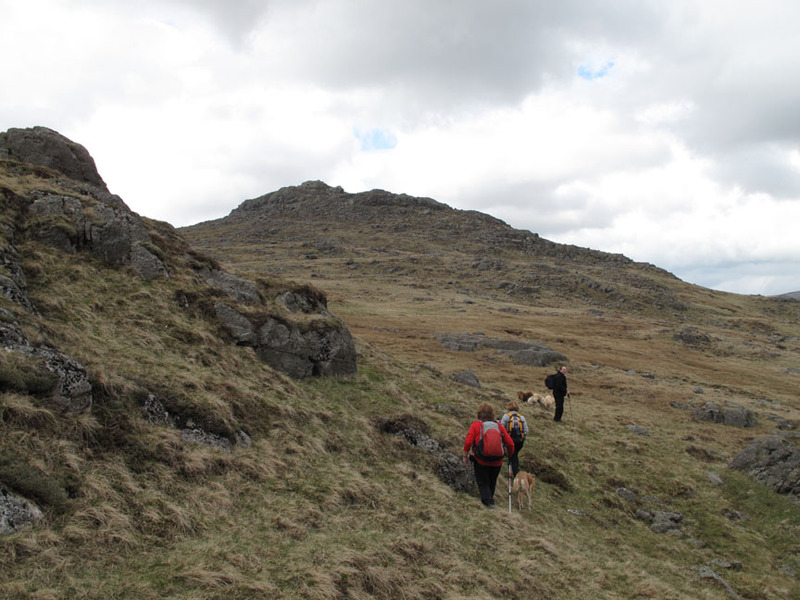 Walked with : Jo, Ian, (no John), Ann and the dogs, Jodie, Amber, Polly, Harry and Bethan. 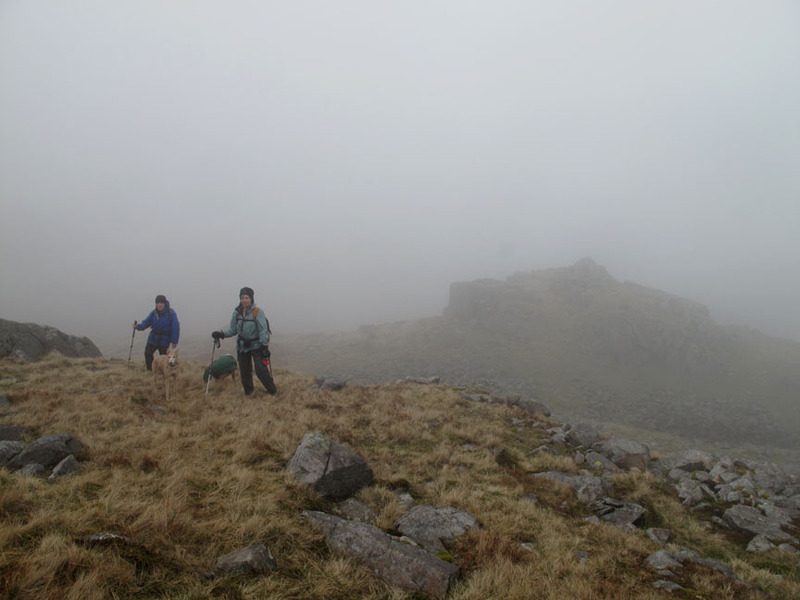 Weather : Fine to start but going downhill as we went up. Forecasted rain. 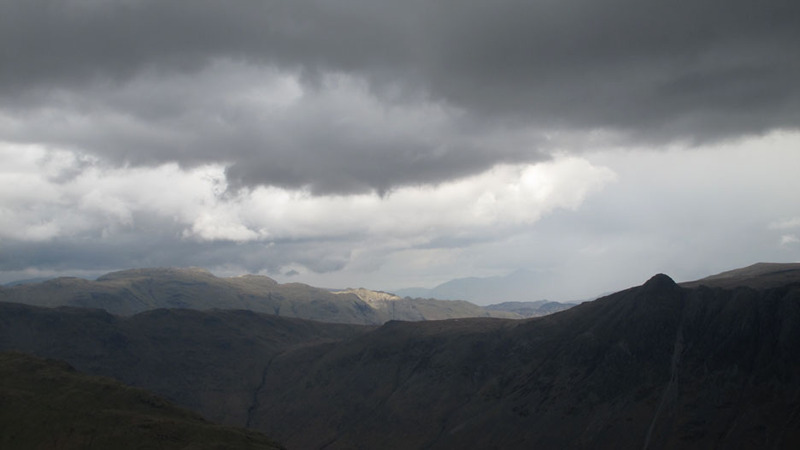 It's the weekend again after a changeable week weather wise. It seems the weatherman keeps forecasting bad weather for our organised days out such as today. I wonder if the wintery showers will materialise or whether we'll have a dry day ? 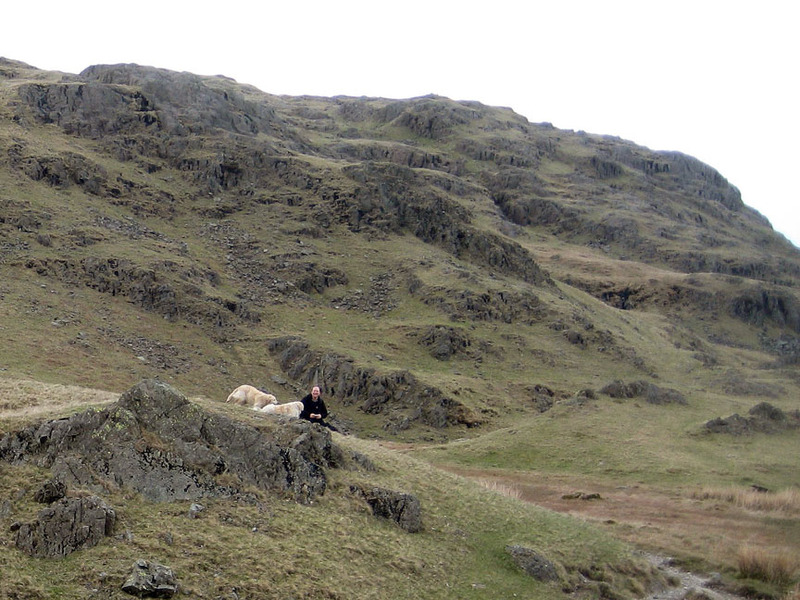 so we just had to stop and catch a photo, with Horse Crags, part of Pike o'Blisco behind. 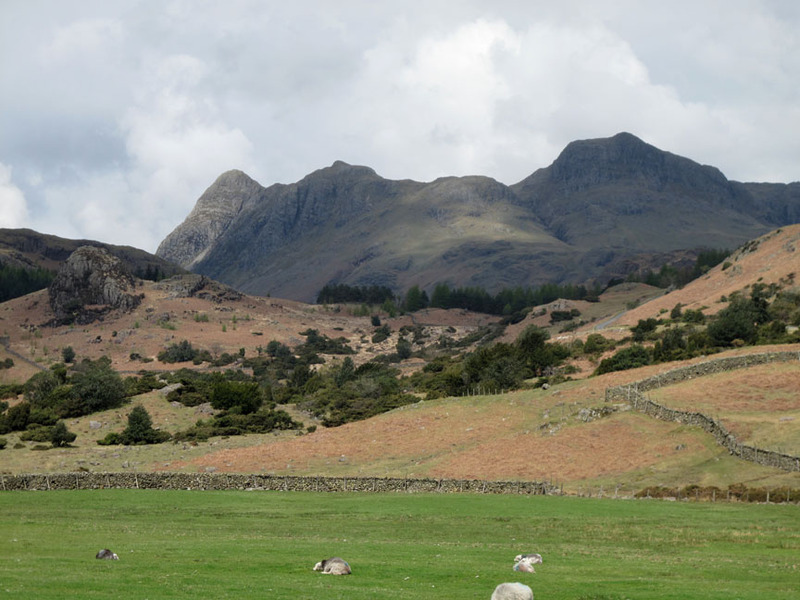 A lovely view also over to the Langdale Pikes seen over the valley Juniper and the larger trees that surround Blea Tarn. Ian had arrived by car from Seascale and was waiting patiently for us. He seems to have two dogs like ours ! Hang on a minute . . . they are ours ! 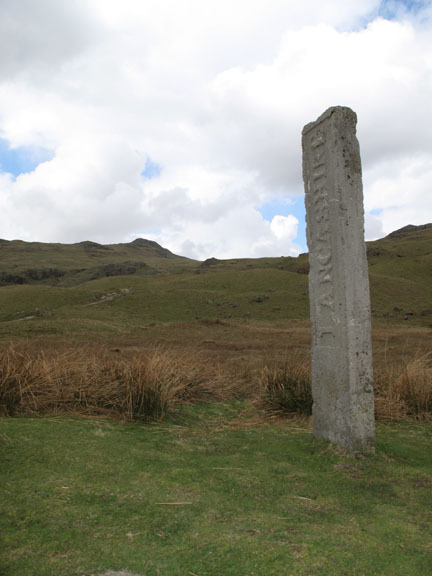 The Three Shires Stone with Lancashire written on this side. 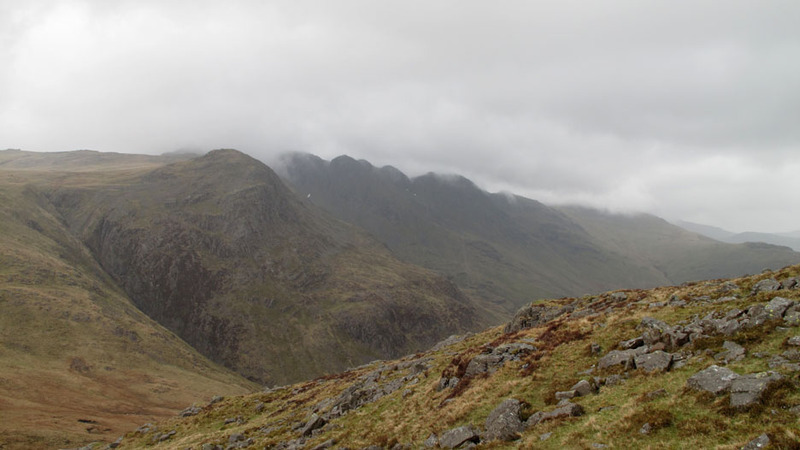 It was the start point for our walk up Pike o'Blisco today. 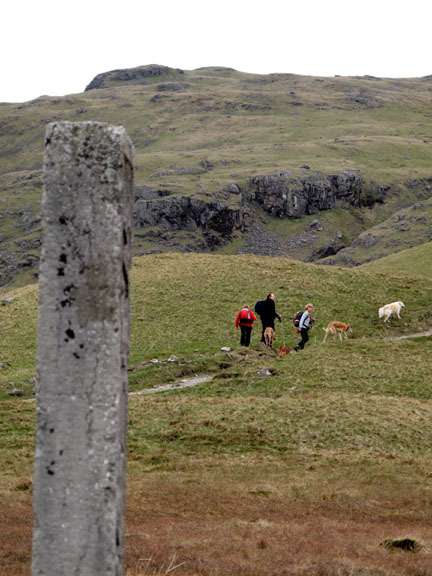 The stone marked the boundary of 3 shires or counties of old . . . Lancashire, Westmorland and Cumberland. You would expect a three sided stone with each county separately marked but in fact the other side just has a date and a few initials. Climbing up the main path we leave the cars far below. 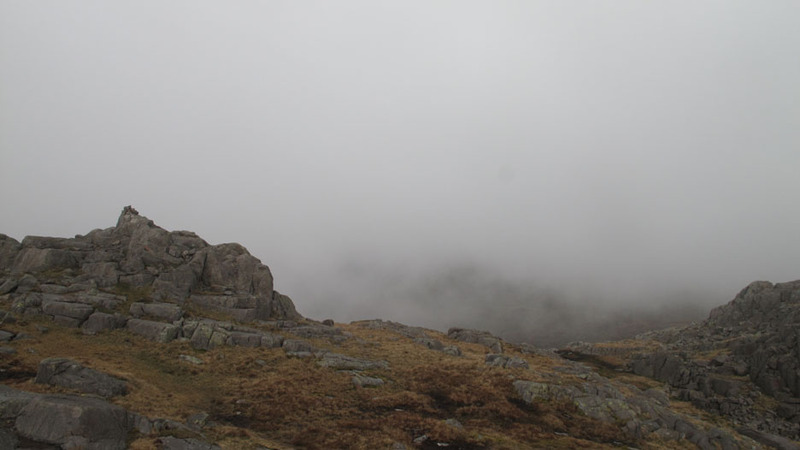 Wetherlam now appears over Wet Side Edge. 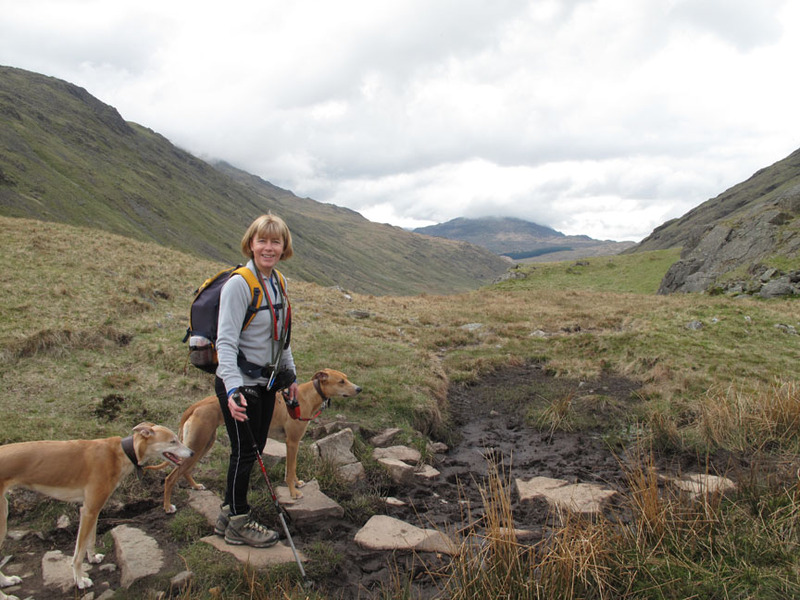 A slightly wet side to the ground here too, but the stepping stones are dry for Jo to cross easily. 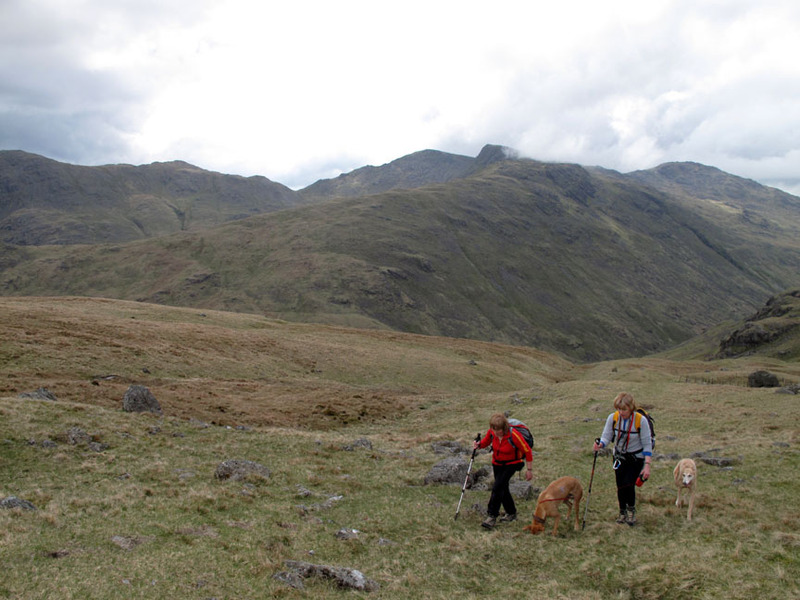 A good pitched path leads up towards Pike o'Blisco as Polly leads the way. 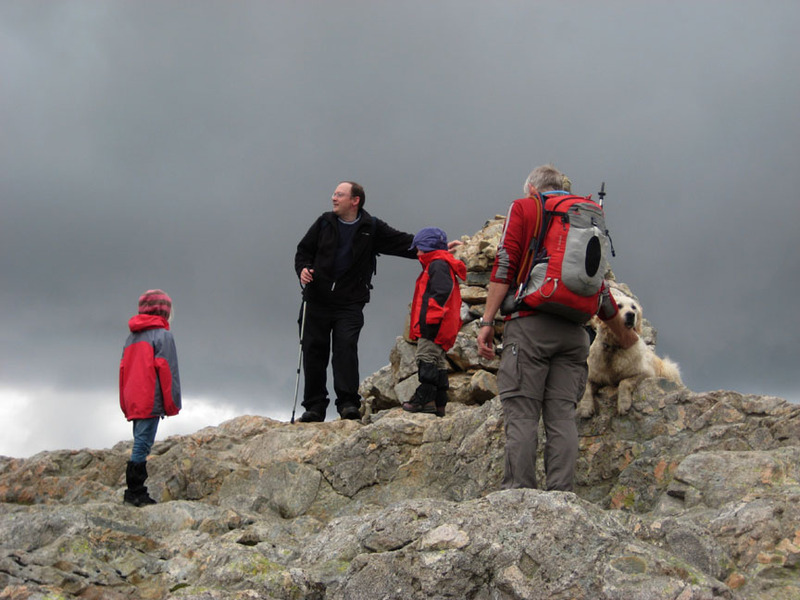 We decided to climb the ridge up to the Pike instead of following the normal path. That way we would have more of a round trip. 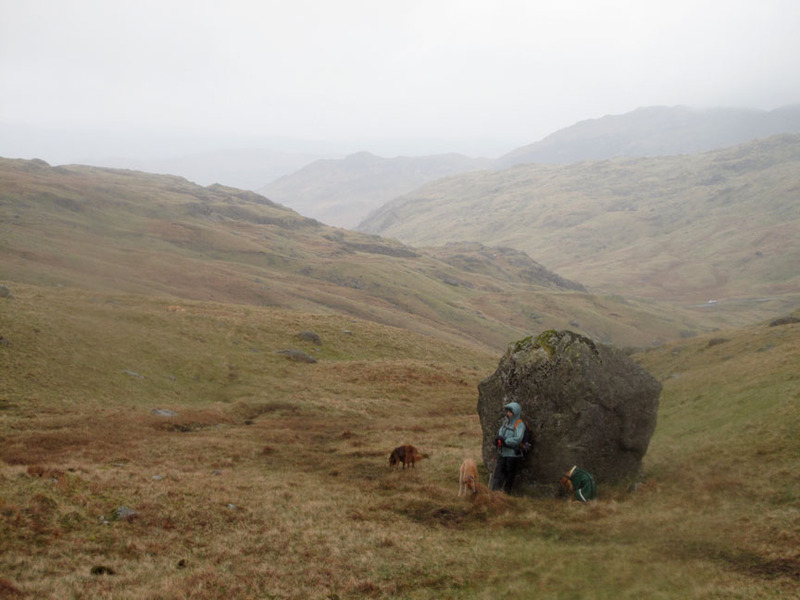 We left the main path and headed up passed this rather large boulder, enclosed in the sheepfold marked on the map. Easy walking despite the faint path. 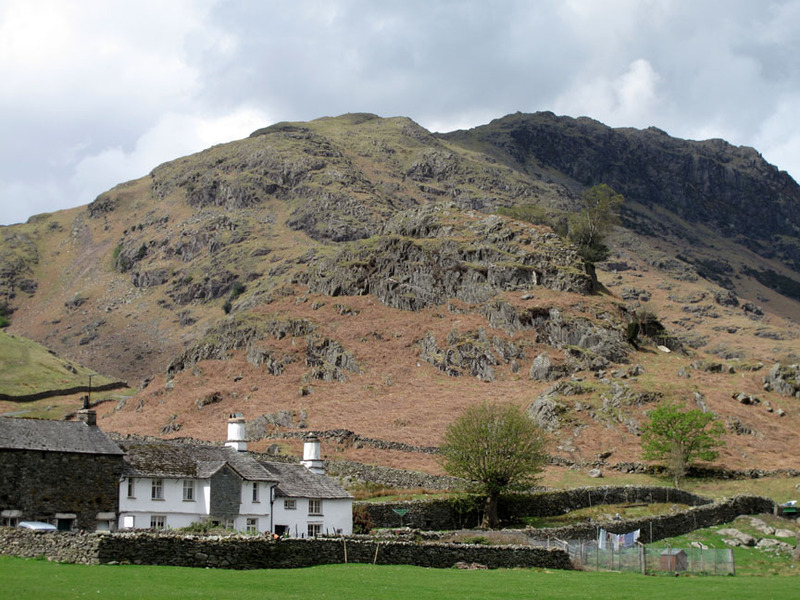 The cloud is just clear of Wetherlam, Black Sail, Swirl How, Great Carrs and Grey Friars opposite. 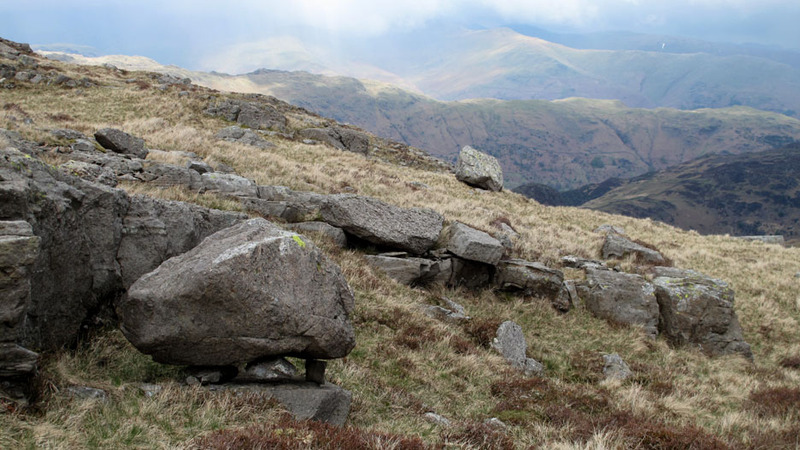 We drift towards Black Crag where there are a couple of rock climbers. 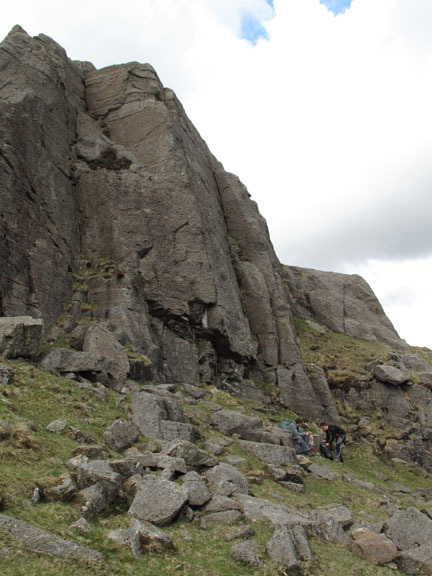 We opt for an easier scramble up through the crag instead. 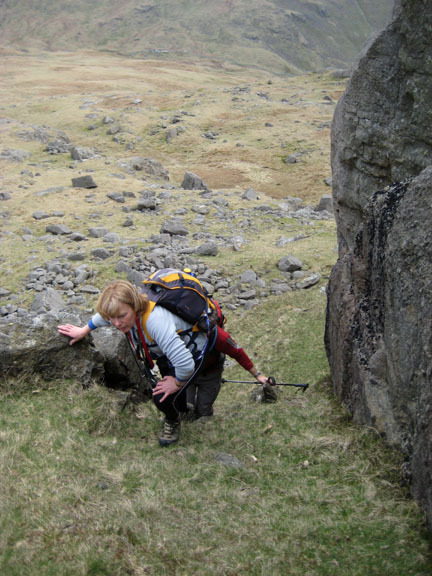 A scramble is defined as a walk using your hands. 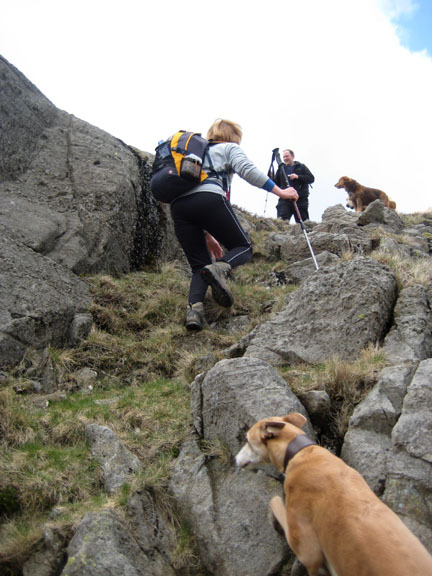 With the occasional long stride up through the crags we make the top. 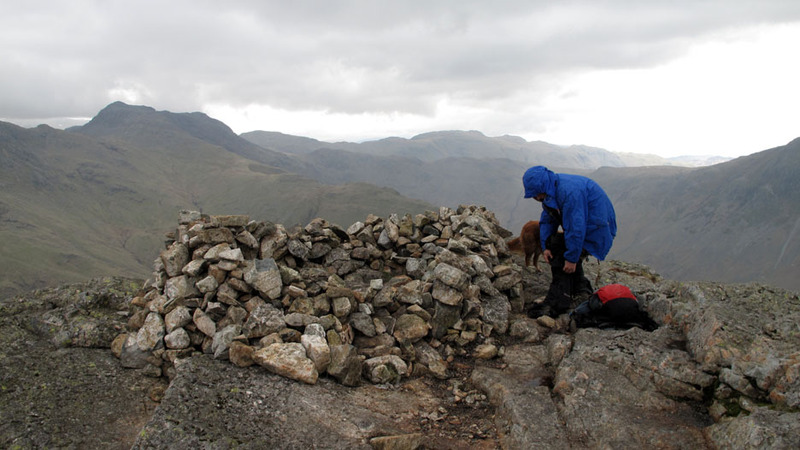 A great little scramble up the skyline . . . the summit is ahead.
" 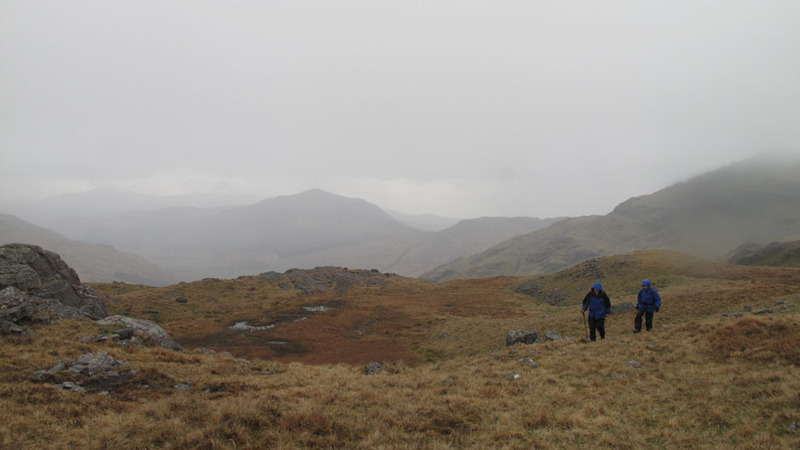 Four seasons in one day "
Sun on Lingmoor, cloud on the Fairfield fells, rain on Seat Sandal and snow in a gully on distant Red Screes. 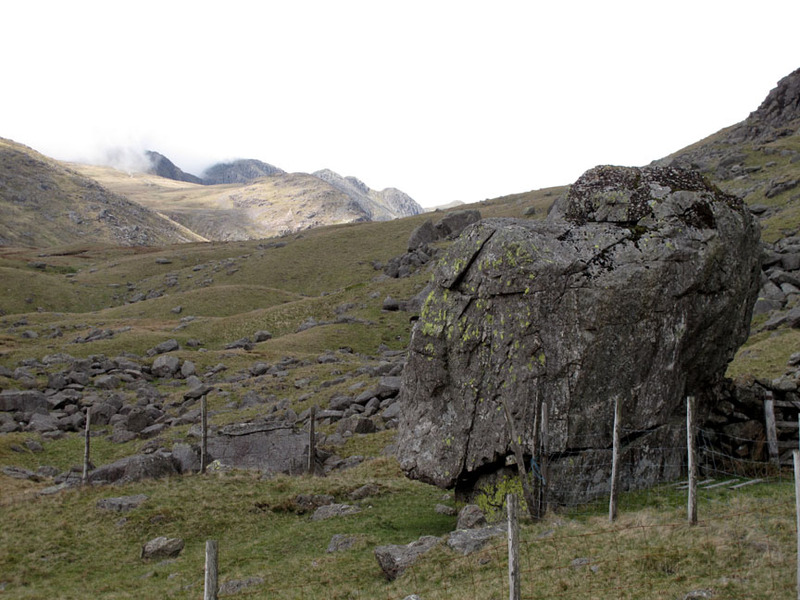 A perched boulder alongside the climb. But if you look closely that rock is supported on fresh, non-weathered stones. 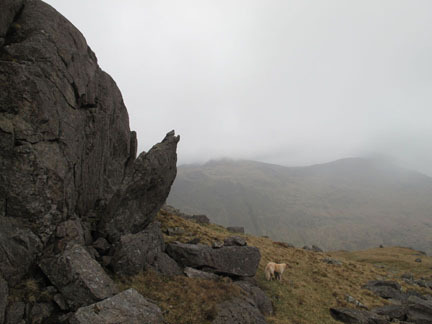 I would say it has been created in the last year, not the last millennia, by some strong passing fell walkers perhaps ? 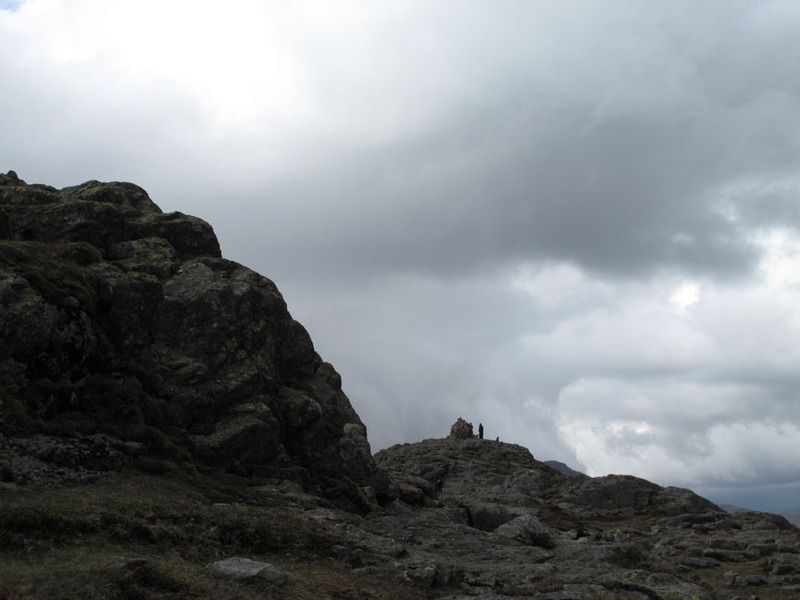 No mistaking the summit as it appears from behind the last of the crags. 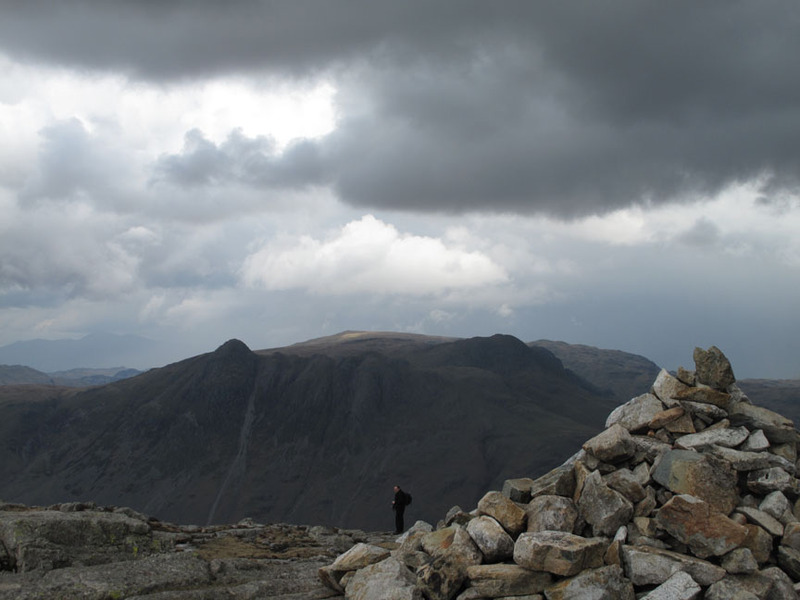 Two groups of people and a load of Path Fairies black bags adorn the summit today. Big Fells . . . little Ian. 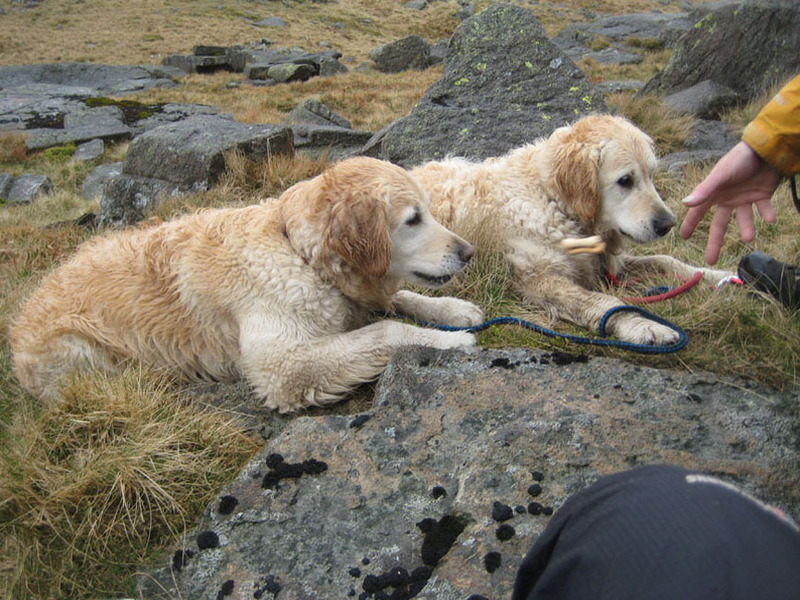 complete with two young members of the family group who had come over to talk to our dogs. Harry and Bethan were Polly sitting today . . . John being away at the footie. Ian . . . master of all he surveys. 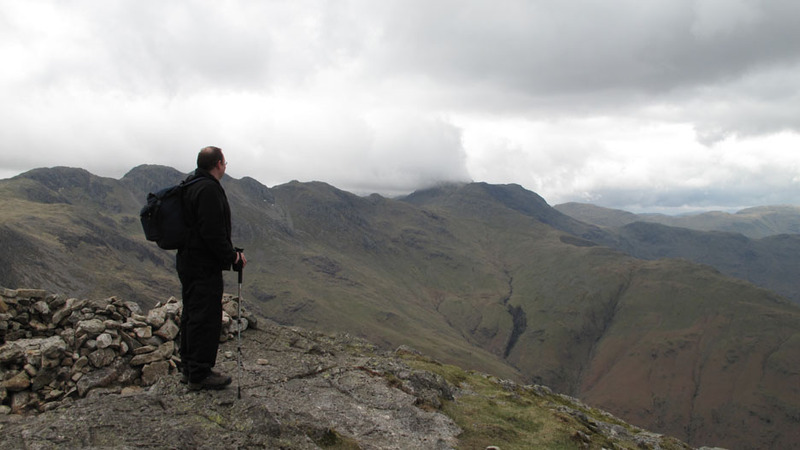 That is Crinkle Crags, Bowfell and all fells to the north west. 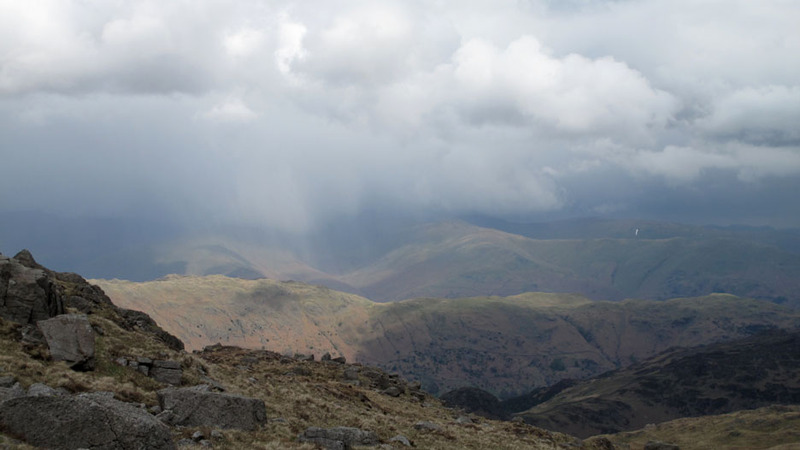 but there's a big rain shower over the Eastern fells. Distant Skiddaw has a covering of moisture too. 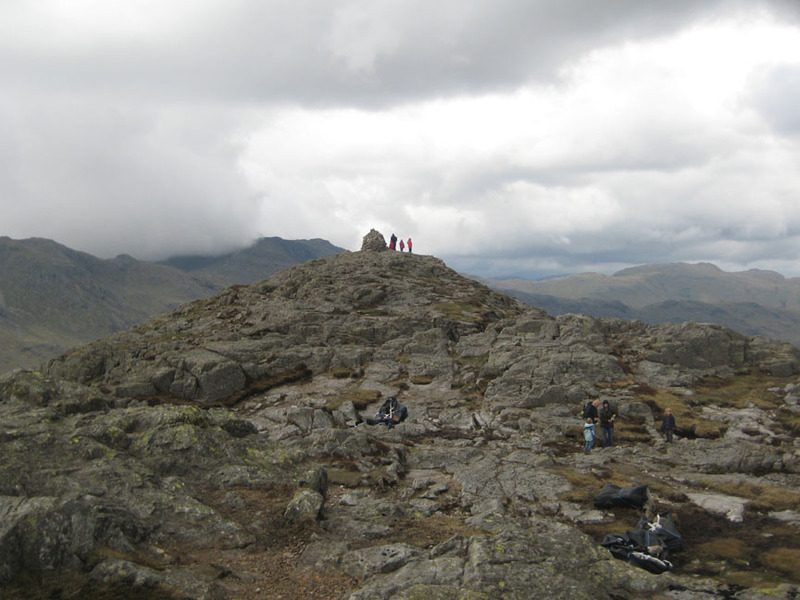 Glaramara to the left is clear and in fine weather but Pike o'Stickle is in serious shadow under the local grey clouds. To the west we have clear views of Black Combe as seen from the summit cairn. 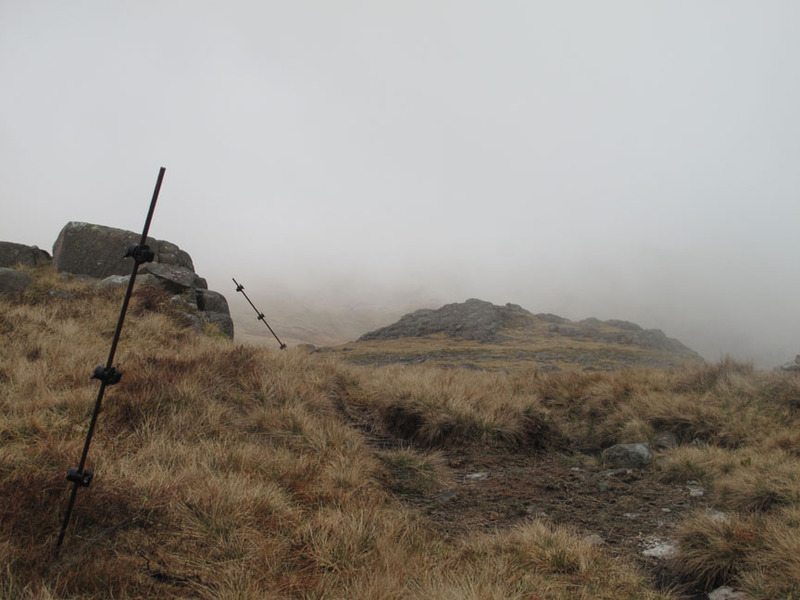 Too early for lunch, perhaps we will find a spot on Cold Fell opposite. Don't speak of fine weather too soon ! 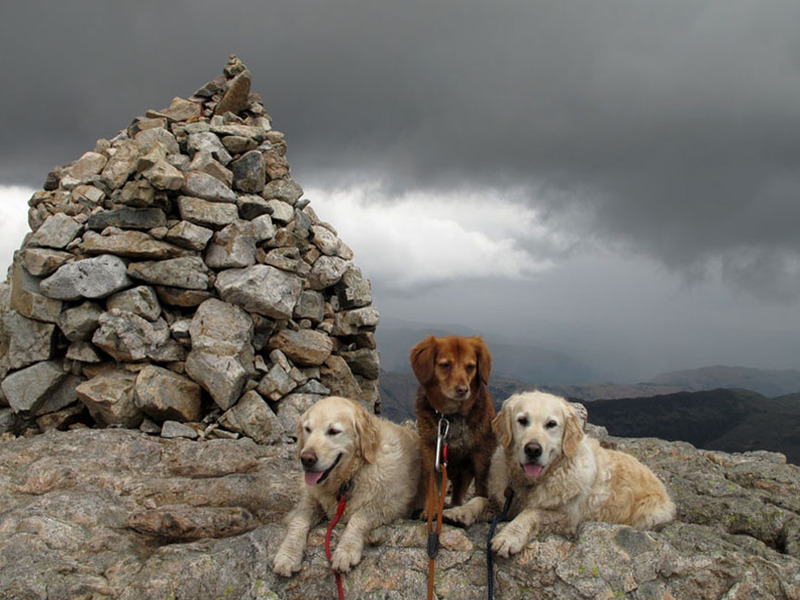 The clouds are heading our direction and Ann steps into her waterproof before the hail stones really start. Mmmm . . . I think we have seen the best of the day ! The low cloud spreads across the landscape and everything is turning a watery shade of grey. Red Tarn as we descend to the hause. 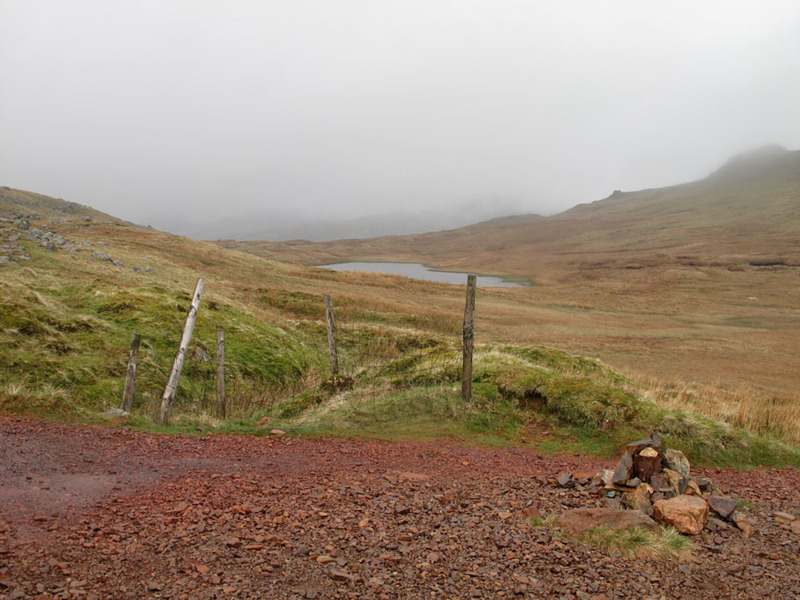 Red Tarn takes its name from the red iron stone in the area. The fence protects sheep (and us) from falling into the small, filled-in mine shaft alongside the path. 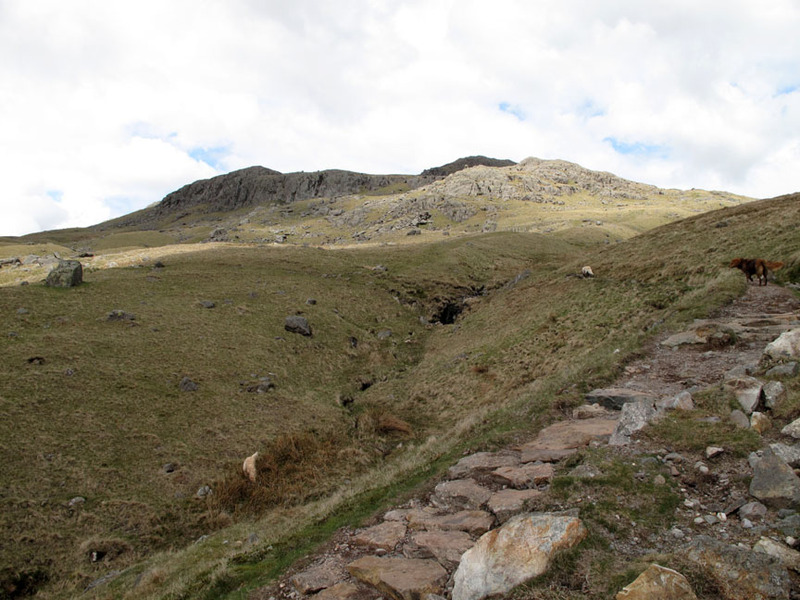 using the path that leads towards Crinkle Crags. Looking back at Pike o'Blisco. The cloud base is falling as the weather deteriorates. 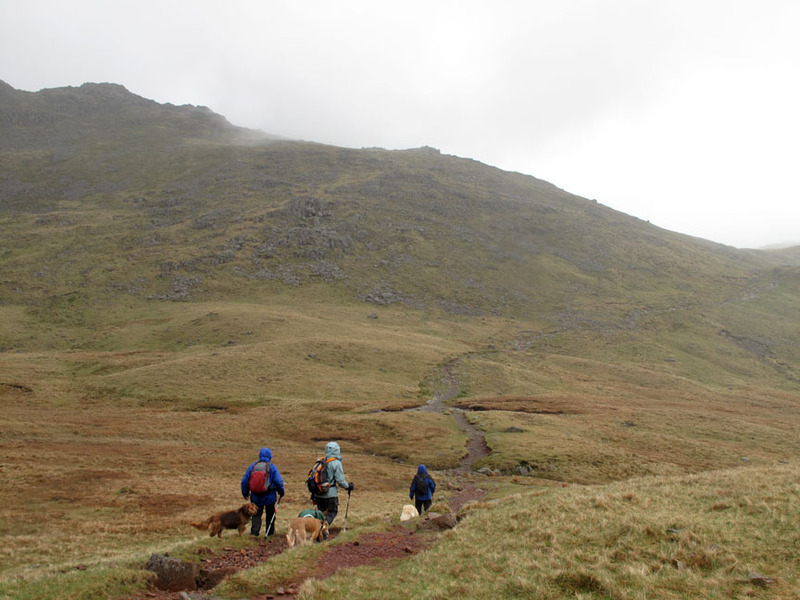 We leave the main path and head up the fell side towards the top of Cold Fell. 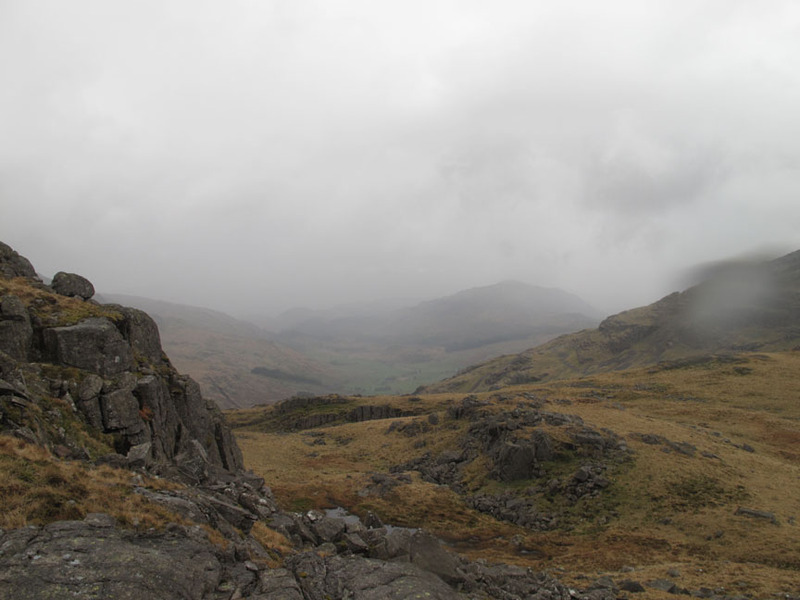 It wasn't exactly raining but we were getting damp as we enter the clouds. 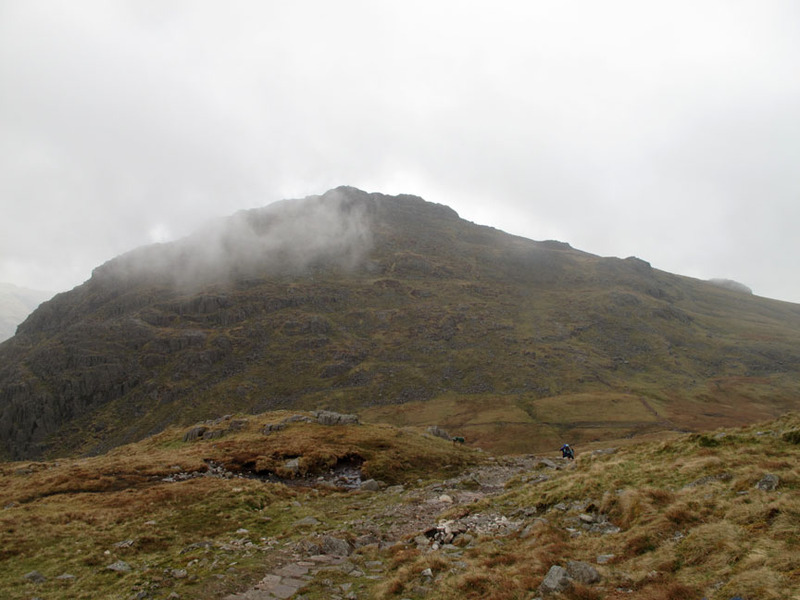 One of the three summit crags on the top seen when the cloud lifts slightly. Lunch time and Cold Fell coincide. I catch Ian mid-mouthful . . . sorry about that ! Still to make up the disappointment of a poor photo . . . Jo offers him a manicure and nail polish ! I feed the dogs a few lunch biscuits. but this one still litters the fells, including the fence wire that lays along the ground, a risk to man and beast alike. 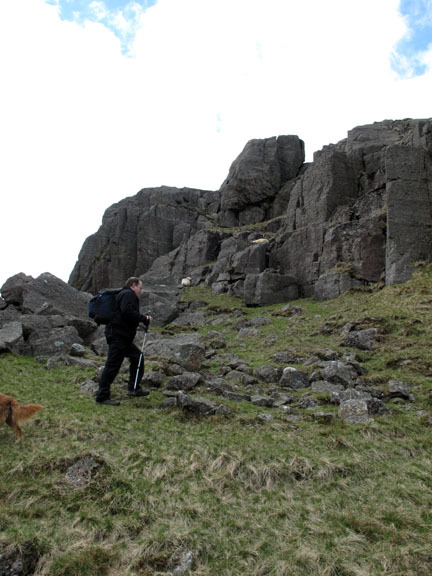 looking for the rock Wainwright called the " Cold Fell Tooth ". A transcript from the book . . .
. . . this looks like it but not quite. However, from the other side, all is revealed. 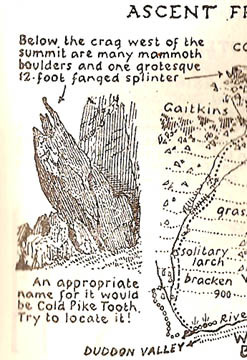 The rock slab has fallen from the crag and lies as an oblique angle, the layers of strata split like fangs at its peak. 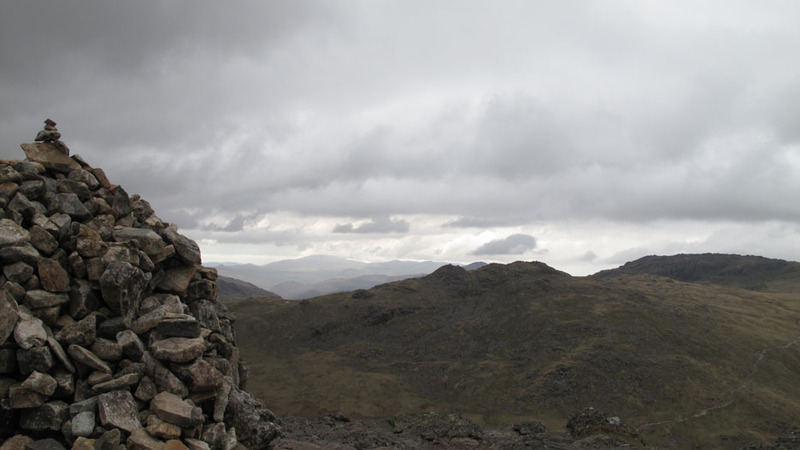 As we drop down, Harter Fell is now consistently clear . 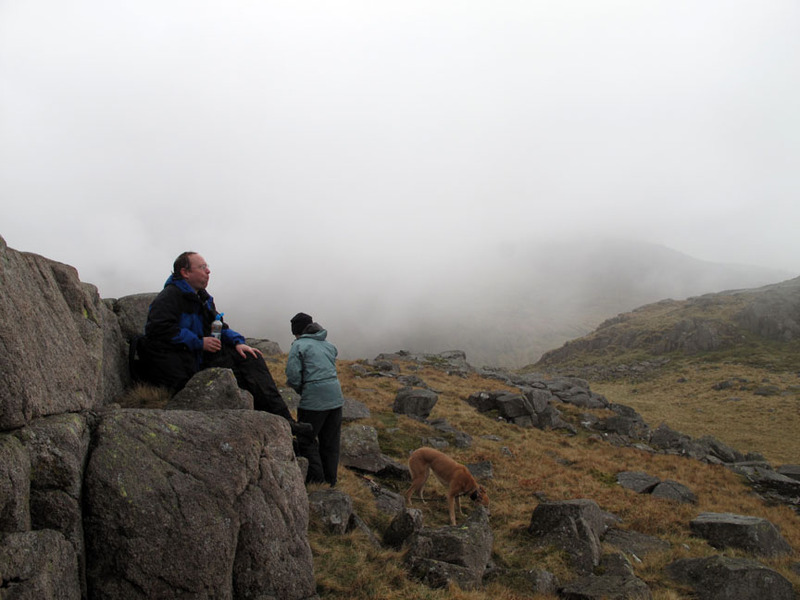 . . it must have been us in the intermittent cloud, not Harter Fell to the west. 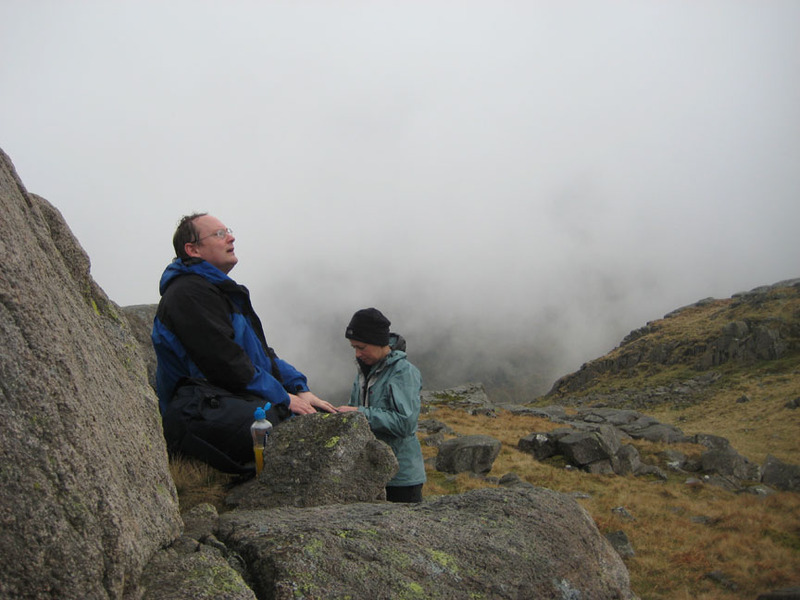 A brief pause alongside a large rock as we make our way back down. The path arcs around, across the top of the beck leading down into the Wrynose Valley, heading for the cars seen below. A Red Tarn Beck . . . no . 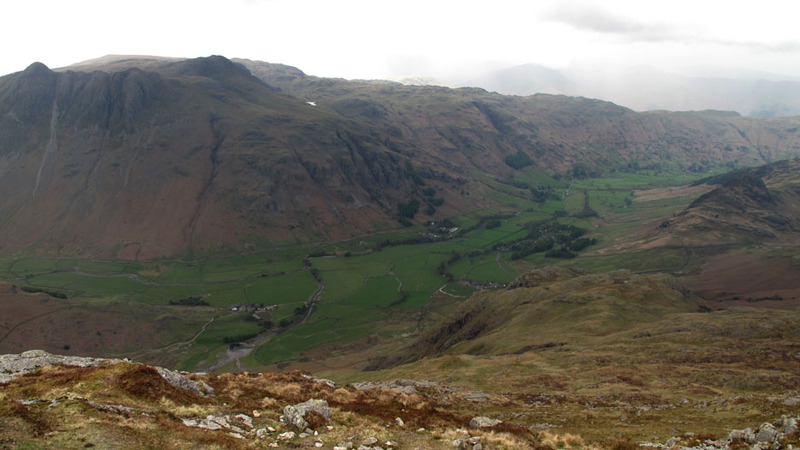 . . that drains the other way into Langdale. This site best viewed with . . . an earlier start time or an later arrival of the forecasted afternoon rain.